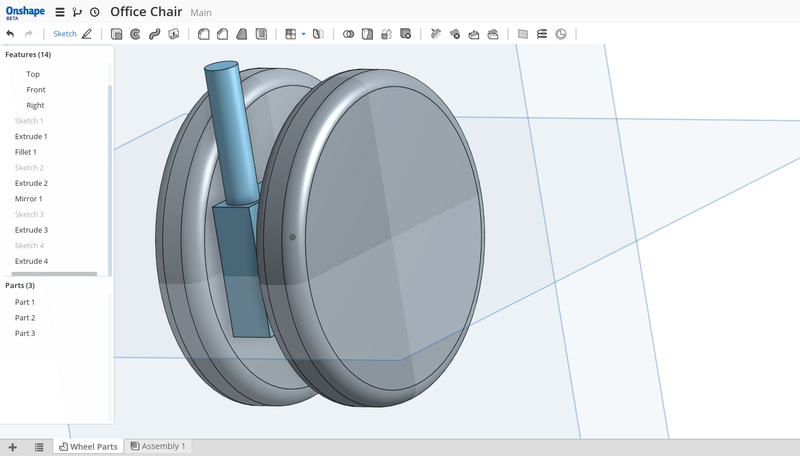 This is the first part of a series of posts about Onshape. 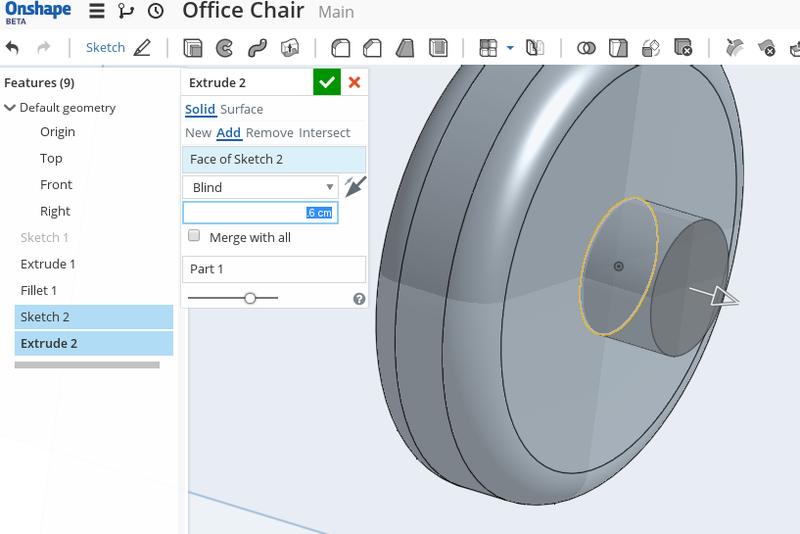 In case you don’t know, Onshape is a cloud-based, online parametric CAD. The result of the tutorial is in this document. 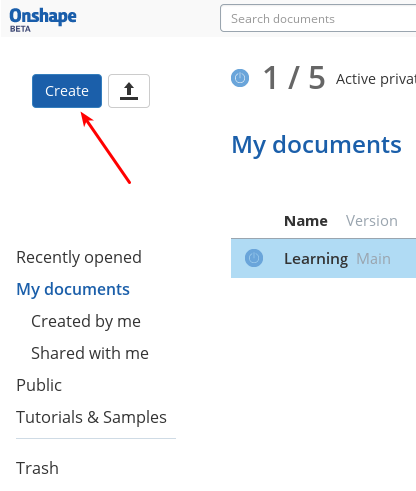 Click “Create” to create a new one. 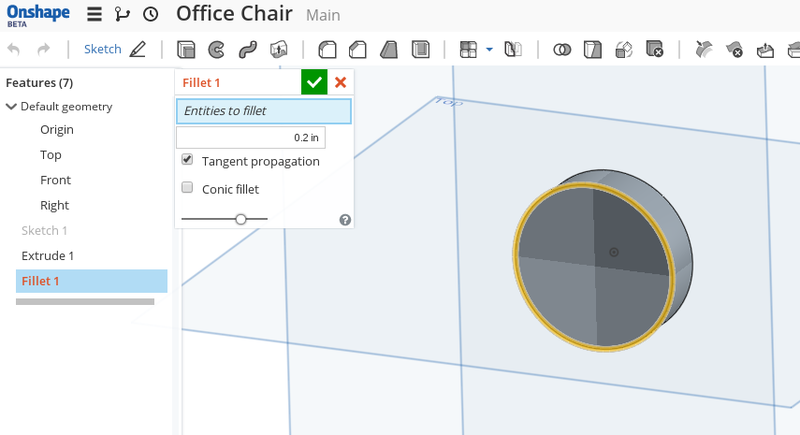 I’d like to design an office chair, so I’ll use “Office Chair” as document name. Read “Interface Basics” to learn how to manipulate the UI. I’d like to get started with my chair. The first thing that it needs is wheels. Let’s create a circle … circle … where is the circle? Where is anything??? 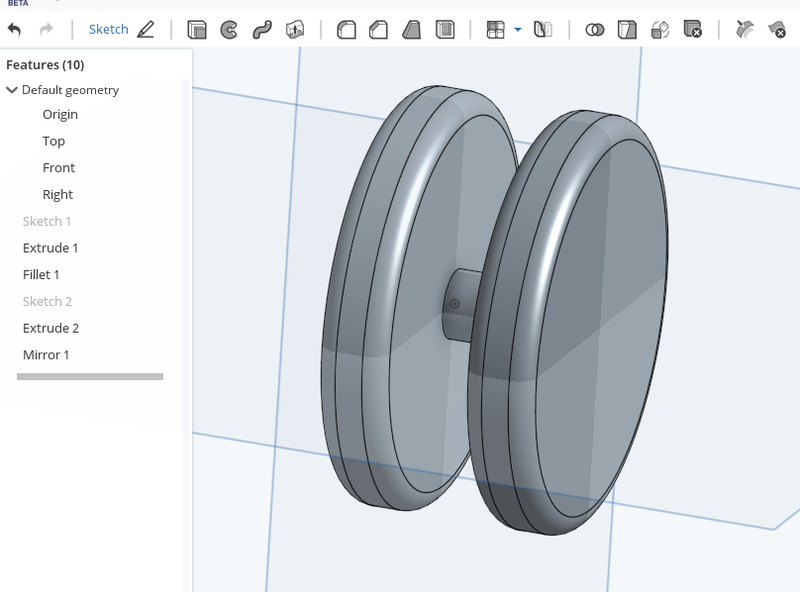 Turns out that Onshape wants to you to create a “sketch” first. Think of a sketch as an outline of something. 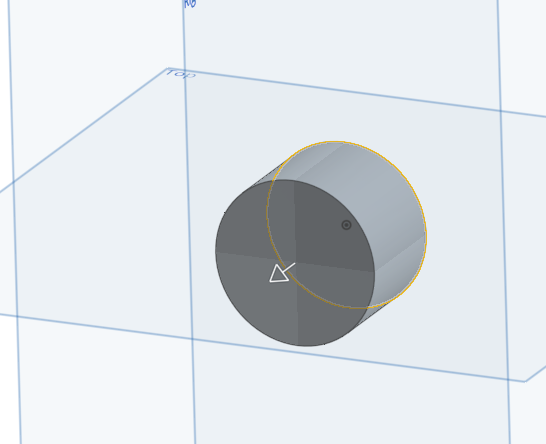 With the tools that you can see now, you can turn this outline into a 3D object. Sounds a bit dry but wait for it. To create a sketch, click on the “Sketch” button (next to the pencil). Onshape tells us what we need to do next. The new sketch was added to the features. Blue things are important or active. 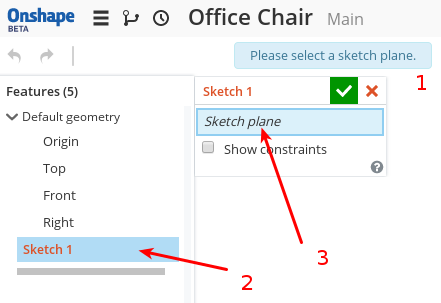 In this case, the “Sketch Plane” selector is active and Onshape wants us to select a plane. If it turns grey, make sure you click it again or the next step won’t work. What does that “a sketch plane” mean? 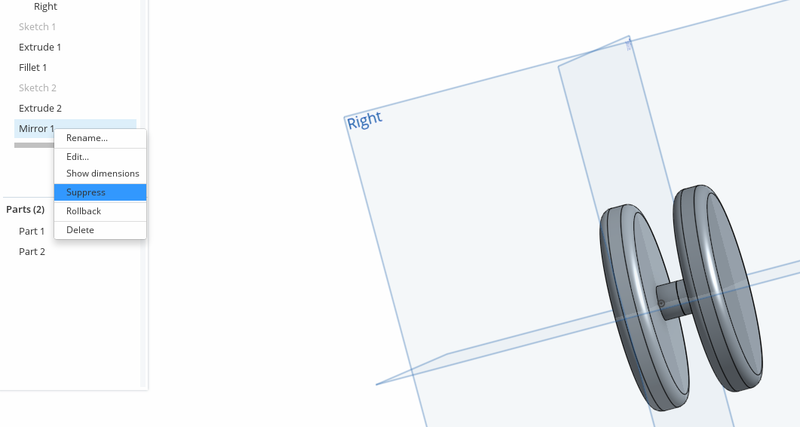 Onshape is a 3D CAD but you probably only have a 2D mouse. 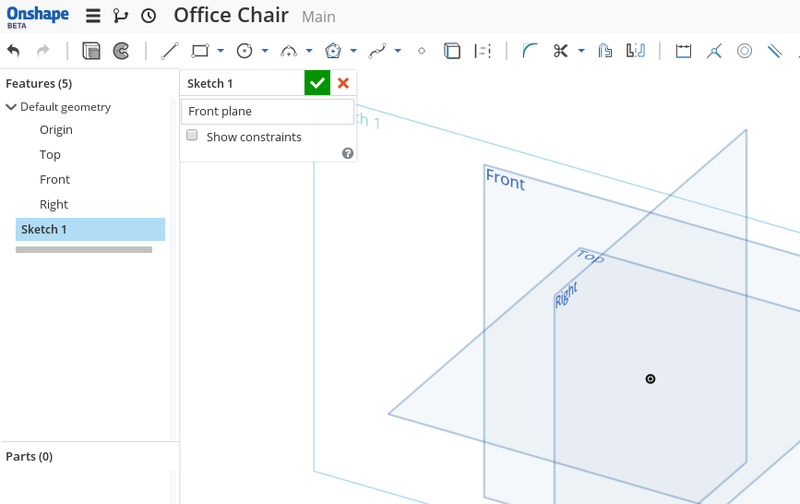 That means Onshape somehow has to reduce one dimension. It does that by letting you select a plane on which all your lines, rectangles and circles will be. 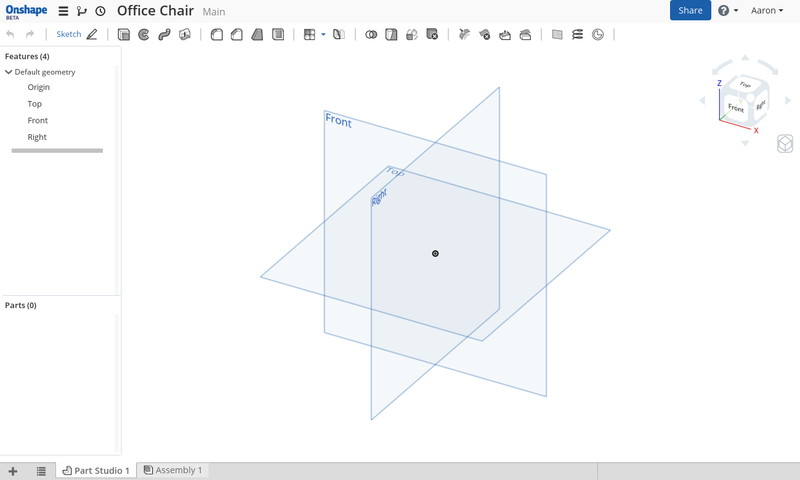 We’ll see how that works out later when we create more complex shapes. As you can see, the blue field turned white, the text changed to “Front plane” and there is now an additional rectangle in the 3D view. If you rotate the view, you’ll see that the new rectangle is always parallel to the “Front” rectangle which is what we want. Also the missing primitive drawing tools (line, rectangle, circle) are now available. Let’s build a wheel. Let’s start with a circle. Click the green button and … Where did the drawing tools go??? Where is my sketch? What is going on? Well, the drawing tools are only visible as long as you’re editing a sketch. So double-click on “Sketch 1” or right-click it and select “Edit”. And the tools are back. Click somewhere in the drawing area and drag the circle as big as you want. I had my first doubt here: How do I enter a diameter or radius? How am I supposed to construct something instead of simply sketching a design? 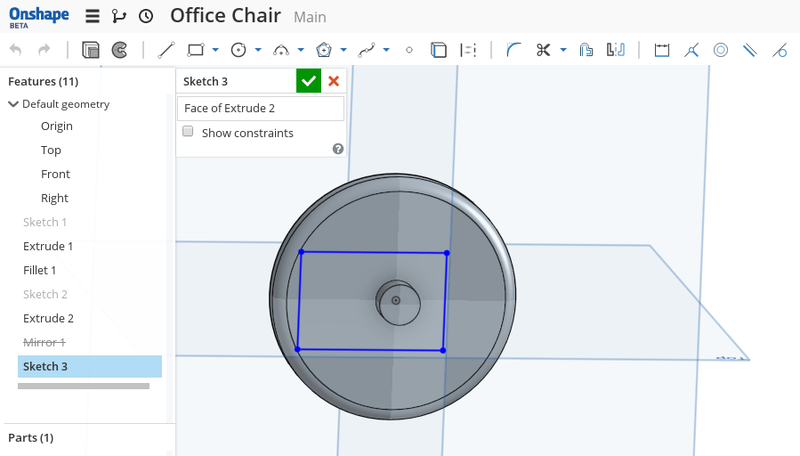 Turns out that Onshape has solved this problem in a really nice and intuitive way. But let’s assume that we have no idea and we just continue working. 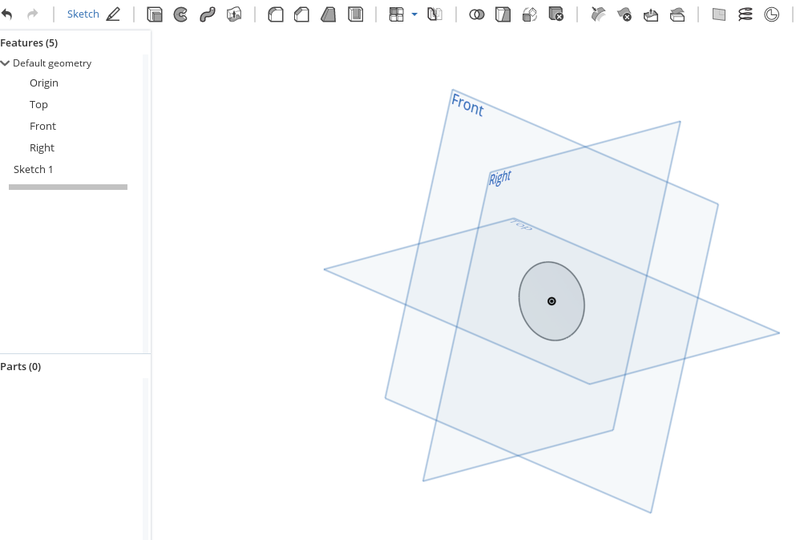 If you rotate the view, then the planes “Front”, “Sketch 1” and the circle should look like they are parallel. We now have the outline of our wheel. The sketch is now ready to be used. Finish editing by clicking the green button. Your workspace should now look like this: “Sketch 1” in the list of features and a dull grey circle. Let’s turn the circle into a cylinder. 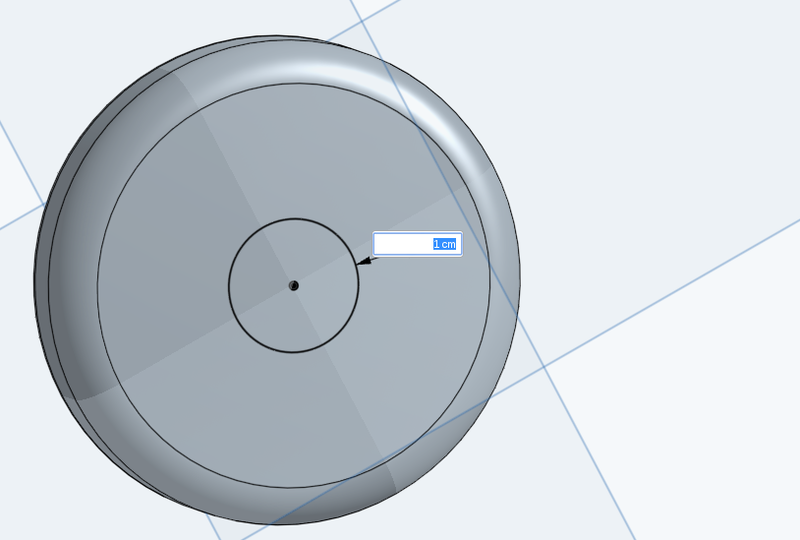 Click “Extrude” (first button to the right of sketch). Important things here: The extrude operation has been added after the sketch. That means it can use our sketch as outline for the operation. The options for extrude are what we want (“Solid” and “New”). The next option (active) is the outline to extrude. Hover inside the circle and it will turn yellow. When you click, the magic will happen. If you drag the arrow around, you can see that the number in the Extrude form changes. That’s the amount by which the outline gets extruded. You can also edit the value directly. Enter “1 cm”. The software will display “0.394 in” and update the cylinder. If you edit the value, you’ll see “1 cm” again. So the software remembers what you originally wanted. Keep that in mind. As you can see, the last tool was finished for us and a new one was added. “Fillet 1” is waiting for us to select the corners we want to round. 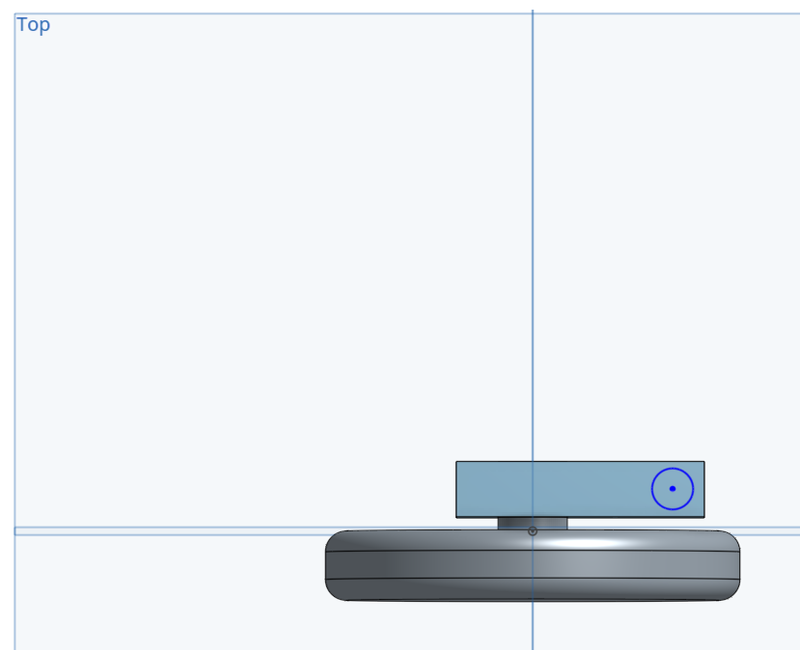 If you hover over the two ends of the cylinder, they’ll turn yellow (as in the image above). When they do, click to add them. 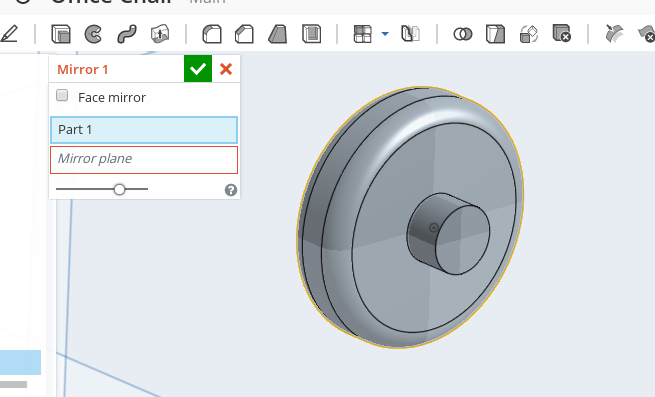 There is no need for Ctrl or Shift, Onshape always toggles the selection when you click on something. You’ll notice something strange: When you select the first circle, the edge will be rounded. But when you select the second one, the effect will be gone. Why? Looks like a wheel to me. But “0.118 in” looks odd. Let’s fix that. Select “Centimeters”. The form won’t update right away, you have to close and reopen it. Let’s add an axis around which the wheel should rotate. Create a new sketch (“Sketch 2”). 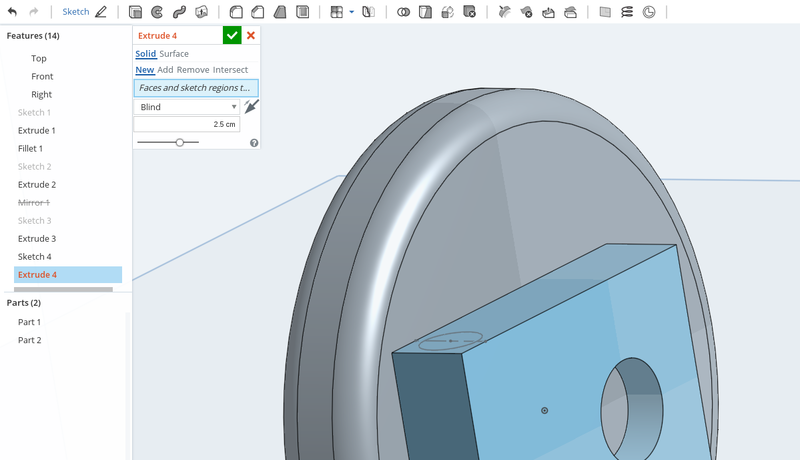 Select the side of the wheel as “sketch plane” which is closest to the plane of “Sketch 1”. The important part here is the little icon with the two lines and the white point. This is a constraint, specifically the “Coincident constraint” which makes sure that those two points will stay in the same place, even when you move one. This will start to make sense later. After adding the circle, we want to make sure it’s exactly 1 cm. How do we do that? 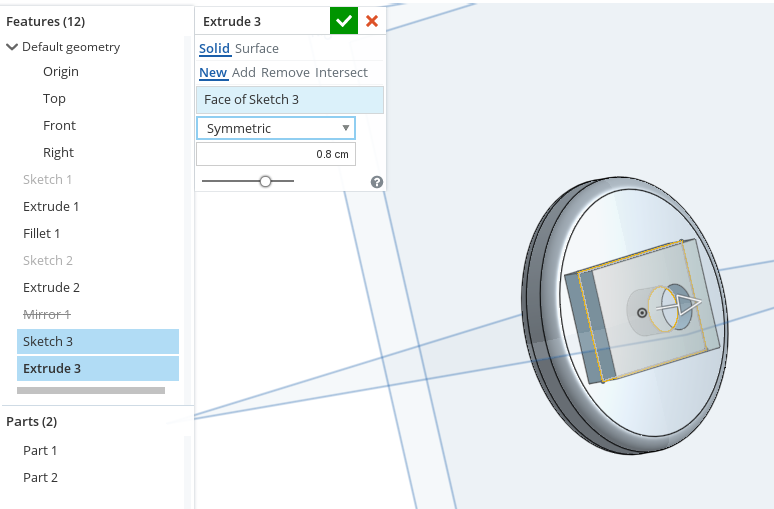 Click extrude to add a 6 mm long cylinder. You need to click inside of the new circle to make this happen. If you click on the circle, you get a hollow cylinder. We want a massive one. The option “Solid” is active. 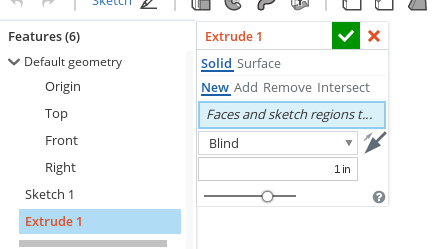 “Face of Sketch 2” is selected which is our circle. That’s the outline that gets extruded. Two wheels, connected with an axis. How big are the wheels? If you remember, we just dragged a circle. Dimension tool to the rescue! Double click “Sketch 1” to edit it. Everything else will be hidden. 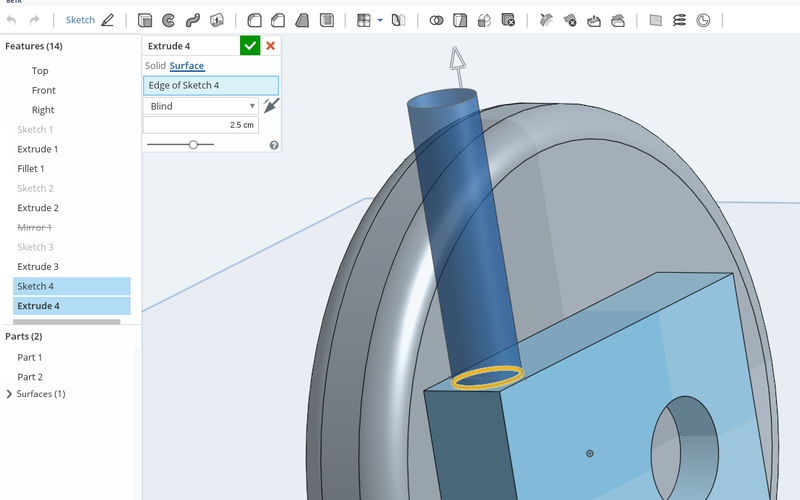 And that’s the power of Onshape: The tool remembers all the steps that you made to create something. If you go back and change a step, it will adjust all the later steps. That means you can really “sketch” (as in “quickly draw something”). When you feel the need to improve a step, go back to it, make the change and everything else will be updated. 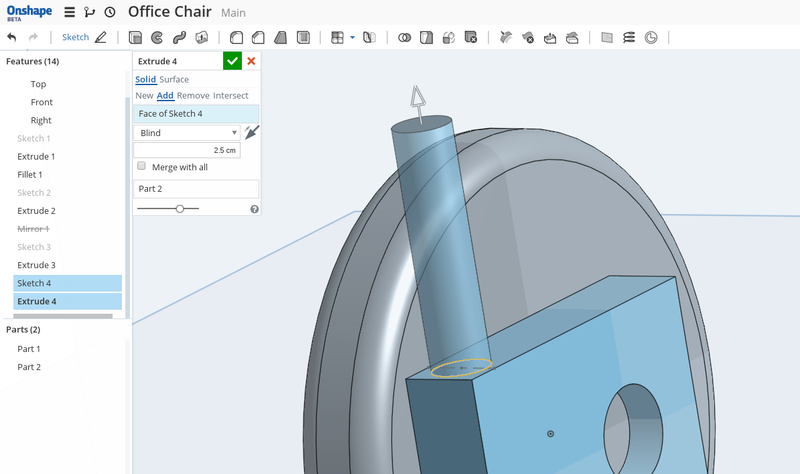 As the last part of this tutorial, let’s add the handle which connects the axis between the wheels and the base of the chair. I’ll construct a simple handle from a box and a cylinder. For the box, I first need a rectangle which goes between the wheels. If you don’t get a hole, remove the selection of “Face of Sketch 3” with the little red “x” next to it (not the big one at the top!) and click again. Time for the last sketch: The cylinder at the top. But we want the circle to be perfectly aligned. For that, we need construction lines. Create a vertical line near the right end of the box. Make sure the “coincident” symbol is visible when you click. When you click a second time, you should also see the “perpendicular” symbol. Select the vertical line and the right edge of the box. What the …? Where is my cylinder?? Make sure “Add” is selected and “Part 2”. Not bad for just a few minutes of work. Next part: Chair Base with 5 spokes. You are currently browsing the Dark Views blog archives for April, 2015.